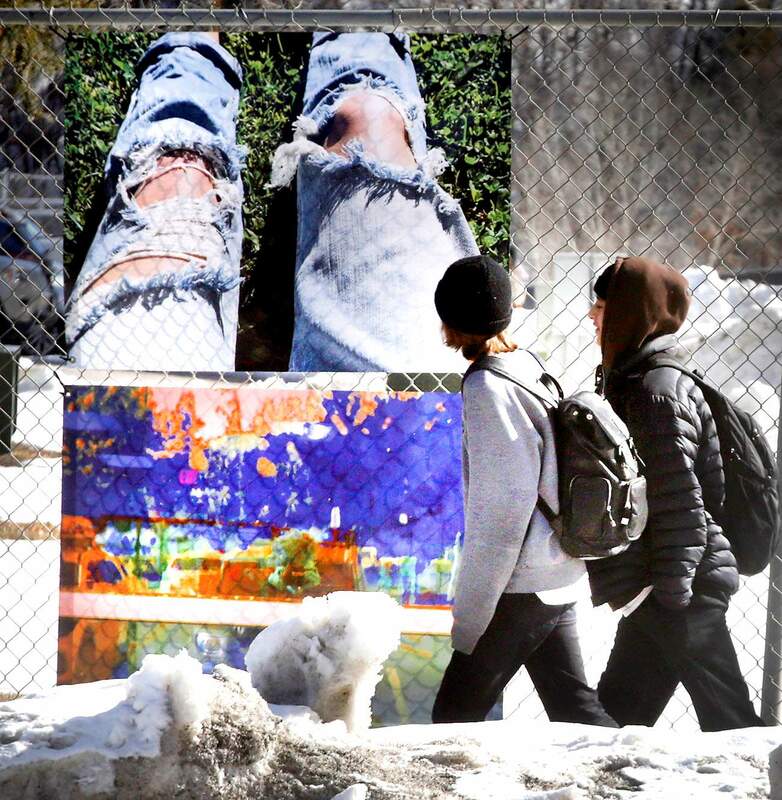 Durango High School students on Wednesday walk past some of their fellow students’ photos affixed to the fence in front of the high school along Main Avenue. DHS students received city funding for the photo gallery. The photos will be up until the end of the semester. 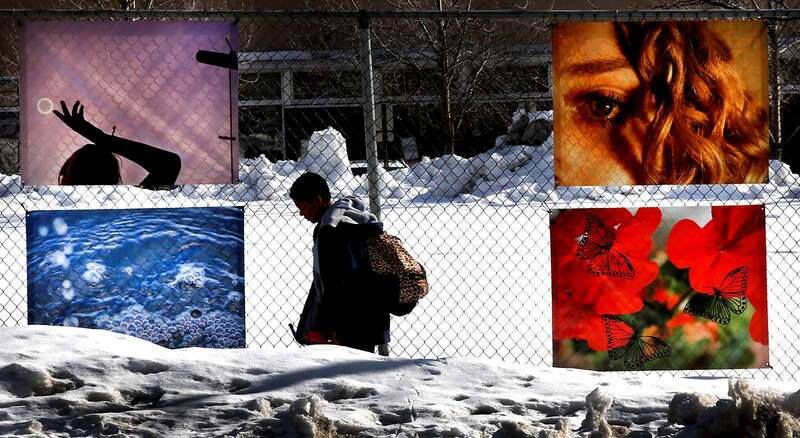 Images lining a fence in front of Durango High School offer a glimpse of the world through a teenager’s eyes. The large banners were produced from photographs taken by DHS digital photography students and reveal some of the places they go and activities they do, said Roxie Mitchell, a photography and new media instructor at the school. Since the banners were installed in December, the display has received a warm reception. The photos of animals – a cat, dog and horse – seem to resonate the most with those who happen upon the “pop-up gallery,” she said. “There is just something really universal about animals,” she said. Durango High School students walk past some of their fellow students’ photos that hang on the fence in front of the high school along Main Avenue on Wednesday. DHS students received city funding for the photo gallery. The photos will be up until the end of the semester. It is not the first time the chain-link fence has been used to display art or messages to the community. The highly visible barrier was used during the 416 Fire to hang signs of gratitude to firefighters who came from across the country to battle the blaze. It was from this that school officials realized they, too, could use the fence to display messages, Mitchell said. “We are always struggling for a place to put student work,” she said. A cyclist rides past Durango High School student photos affixed to the fence in front of the high school along Main Avenue on Wednesday. DHS students received city funding for the photo gallery. The photos will be up until the end of the semester. The display is meant to humanize the teenage experience and beautify the institutional look of the DHS campus from the street, according to the project’s grant application. The new installation is one of a handful of projects funded through the Durango Creates! grant program, which started last year. The grant is a city of Durango initiative designed to improve the aesthetics of north Main Avenue and Camino del Rio. The city set aside $20,000 in grant funding for the program last year and it has set aside $15,000 for the program this year. Mitchell initially applied for $2,305 in funding for the project. However, the Durango Art Commission, which oversees the program, approved $3,400 for the project and encouraged Mitchell to install larger banners, said Colleen O’Brien, the city’s business development and redevelopment coordinator. The project required $2,600 in funding, and it would have been impossible to produce such large vinyl banners without the support, Mitchell said. “As a public school, one of our biggest barriers is money,” she said. 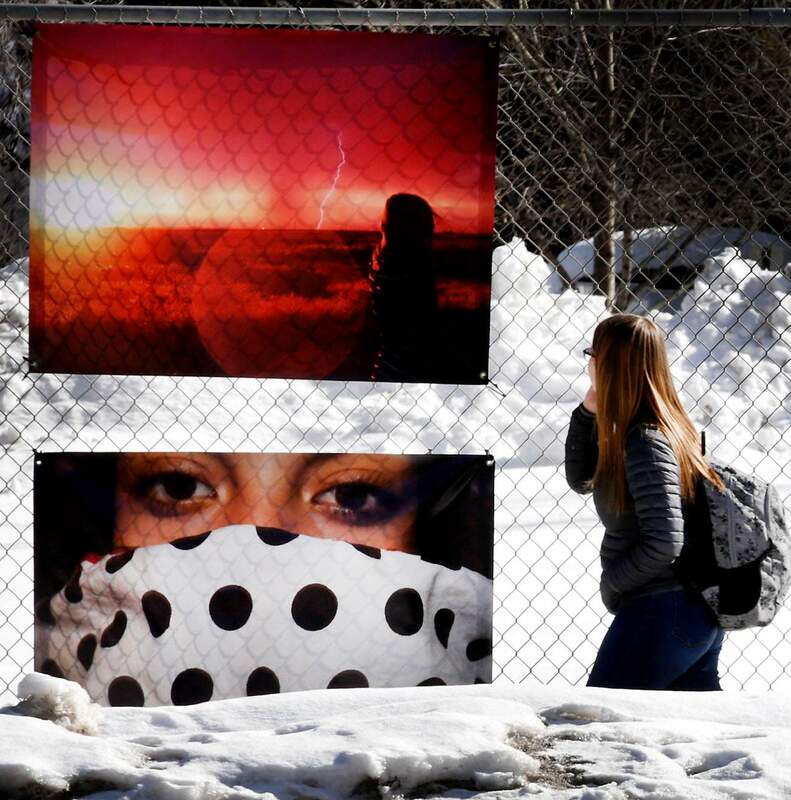 Durango High School students on Wednesday walk past some of their fellow students’ photos that hang on the fence in front of the high school along Main Avenue. The photos will be displayed through the spring semester and then given to the student photographers to take home, she said. Among the images selected for the display was Keeleigh McCalls’ photo of a woman in a red fur coat holding a necklace. She appreciated the elegance and vibrancy of the image, she said. “It just spoke to me as I was looking through my photos,” said McCall, 15. The sophomore said she may pursue photography professionally in the future. “I like capturing things in the moment and having that just forever. It is a really nice way to express myself,” she said. Pop-up gallery in front of DHS Durango High School received a grant from Durango Creates! to display students’ photographs and multimedia photographs printed on vinyl banners and hung on a chain-link fence in front of the high school. Durango High School received a grant from Durango Creates! to display students’ photographs and multimedia photographs printed on vinyl banners and hung on a chain-link fence in front of the high school.